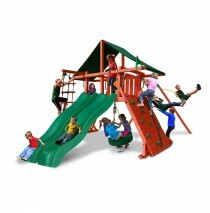 Shop Gorilla Playsets because this company is one of the best and their product line is extensive. 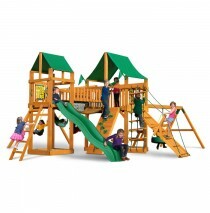 They offer first-rate wood playsets and accessories that are reasonably priced. The line is geared toward the consumer who wants to purchase and have it build right a way, usually within a couple of weeks. 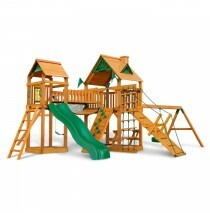 The playgrounds are sold as a complete set packaged with everything you need to build. 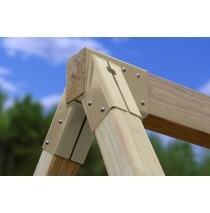 These reasonably priced structures are pre-boxed and that offers a big savings to the customer. 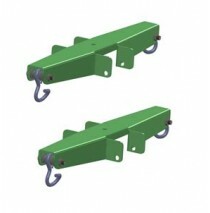 The T-nut construction of these kits makes residential building in a backyard fairly straightforward. It can be built to specifications and made safe by using everyday household tools. You take delivery of the whole thing, meaning the wood, slide, accessories, and hardware as well as step-by-step 3-D directions. 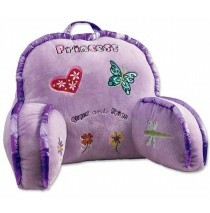 The company offers phone support with a 10 year warranty. 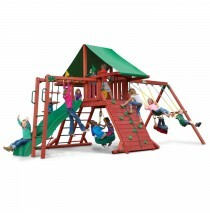 The Sun Valley I Swing Set with Green Vinyl Tarp has a little something to please everyo.. The Sun Valley II swing set starts with the basic features of the Sun Valley set, but added some upg..
Blue Ridge Pioneer Peak Swing Set by Gorilla. 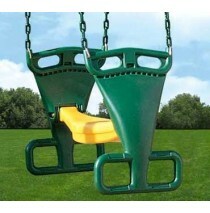 These great swing sets are a huge hit with everyone wi.. 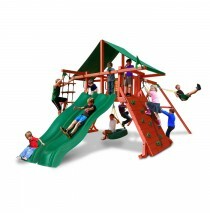 The Sun Climber I has fun features like a a wave slide, a large rock climbing wall, and a turbo tire.. 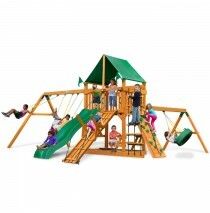 The Sun Climber II Swing Set come with a Sunbrella Canvas Forest Green Canopy and Monkey Bars. Kids .. The Sun Climber also has 2 belt swings, monkey bars, a trapeze bar, a climbing ladder, the covered p..
Pioneer Peak Swing Set by Gorilla. 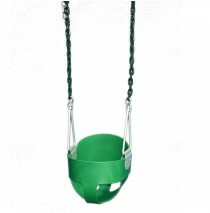 These great swing sets are a huge hit with everyone with their so..
Pioneer Peak Swing Set w/ Amber Posts and Sunbrella Canvas Forest Green Canopy. These great swing se.. 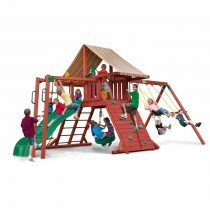 The Pioneer Peak Treehouse Swing Set from Goriila Playsets is an all cedar playset. 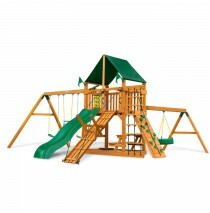 It features a To..
Gorilla Playsets Frontier Cedar Swing Set features factory stained and sealed Cedar that naturally r..
Gorilla Playsets Frontier Swing Set w/ Amber Posts and Deluxe Green Vinyl Canopy features factory st..
Frontier Swing Set w/ Amber Posts and Sunbrella Canvas Forest Green Canopy features factory stained .. The Gorilla Playsets Sun Valley Extreme Swing Set with Two slides has a little something to please e..
New for 2015 is this super fun Sun Valley Deluxe from Gorilla Playsets. This swing set comes with a ..
Have an adventure in your backyard! 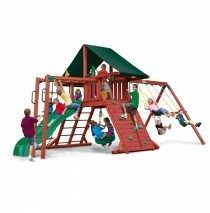 The Gorilla Playsets Frontier Treehouse Swing Set with Amber Pos.. This swing set is a delight for your backyard. Gorilla Playsets Sun Climber Deluxe Swing Set has two..
Two slides are better than one and with two Alpine Wave Slides™ side by side you are bound to have a..